Come, eat of my food, and drink of the wine I have mixed! Forsake foolishness that you may live; advance in the way of understanding. There were no chapters and verses when the book of Proverbs was written; to understand Wisdom’s call, we need to read it in the context of Wisdom’s participation as God’s craftsman in the creation of the universe, and the Lord’s delight. The food and the wine that she has mixed are newly created, made by God’s design and Wisdom’s handiwork. Things were not so different when the book of Proverbs was written down; Wisdom herself says, “He who corrects an arrogant man earns insult; and he who reproves a wicked man incurs opprobrium.” In fact, refusing to listen and consider wisdom from other sources is, perhaps, the definition of arrogance. This is why, a few lines later, Wisdom says that the beginning of Wisdom – the threshold to sharing in her understanding – is the fear (or awe) of the Lord. Someone who understands the depth and glory of the Lord will not turn aside, but will listen – and thus begin to learn. The hints of false teachings are here, too: Folly has also prepared a table and set out a meal. 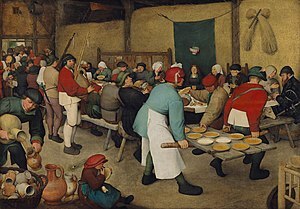 Her words are foolish on their face: “Stolen water is sweet, and bread gotten secretly [stolen? at the wrong time?] is pleasing.” Rather than food that is created fresh and whole, Folly offers only water and bread made elsewhere and for other purposes. It is Folly, rather than Wisdom, that is stale. Yet our culture, too, presents whatever belongs to someone else or is off-limits as particularly tantalizing. As we go forward in the book of Proverbs, which now moves into the sayings of Solomon, it is important to remember that each of the hundreds of sayings is a tidbit from the banquet Wisdom has prepared for us. Instruct a wise man, and he becomes still wiser; teach a just man, and he advances in learning. The beginning of wisdom is the fear of the LORD, and knowledge of the Holy One is understanding. If you are wise, it is to your own advantage.